Whenver the weather is bad it's likely that I'm out in the field. Bad weather makes for great photography and while many times bad weather may lead to no photographs, when things do come together just right you may find yourself photographing in some of the most beautiful and spectacular conditions. A strong late April winter snow storm had been hammering Rocky Mountain National Park. RMNP recieved nearly 2 ft of snow from the this powerful late season storm. 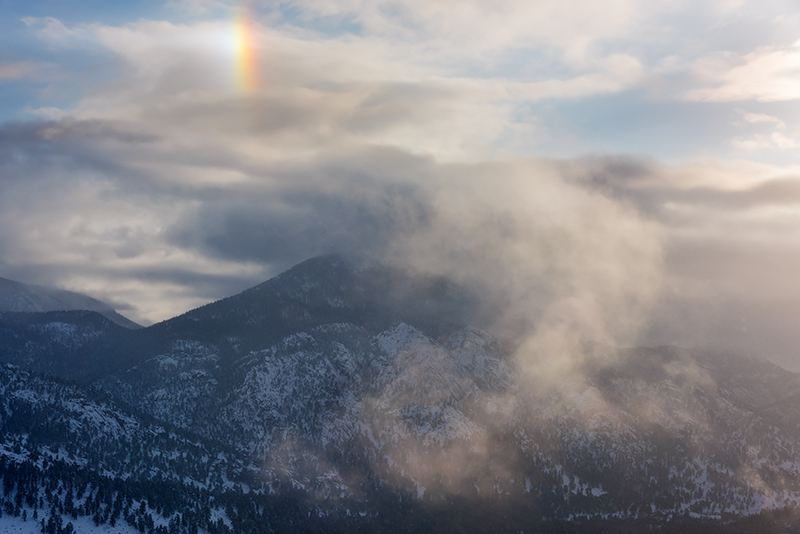 A short respite in the storm allowed for a little clearing one morning over Horseshoe Park and McGregor Mountain. It did not last long as the snow had already started to fall again despite the sun peaking through the cloud cover. The falling snow and sun created a unique phenomenon in the sky know as a 'Sun Dog'. The snow and ice crystals in the sky combined with the direct sun light for something simmilar to a rainbow in the sky. You can see the sun dog in the sky over McGregor Mountain. This is what makes being out in Rocky both rewarding and beautiful, you never know what you are going to see. Photo © copyright by Thomas Mangan.